In 1947, social-issue pictures were starting to come out of Hollywood that tackled a formerly taboo subject — antisemitism. This might not seem like such a big deal today, but it was a big deal at the time. No matter how artful or moving some of its products are, the film industry is still a business, and any subject that challenges the status quo or that might hurt ticket sales is extremely difficult to make a film about. And despite the fact that in the ’40s the majority of studio heads were Jewish, they preferred to release films that depicted a homogenous, idealized vision of America. Richard Brook’s 1945 novel The Brick Foxhole is about a homosexual who is beaten to death by his fellow Marines. Producer Adrian Scott convinced the studio bosses at RKO Radio Pictures that an adaptation of the book would pass muster with the production code if the gay character in the novel were changed to a Jewish character. Crossfire is a social-issue picture wrapped in a murder mystery. It’s likely that many ticket buyers didn’t realize the film would contain a message about antisemitism, and were attracted by the “three Bobs” in the credits (Robert Ryan, Robert Young, and Robert Mitchum) or the lurid promise of violent death in the poster. Edward Dmytryk, the director of Crossfire, once said in an interview that he used “film noir” techniques primarily to save money, and because he wanted to spend more time working with the actors than doing setups. Dmytryk and his cinematographer, J. Roy Hunt, worked six and a half hours a day, and did about seven setups a day. 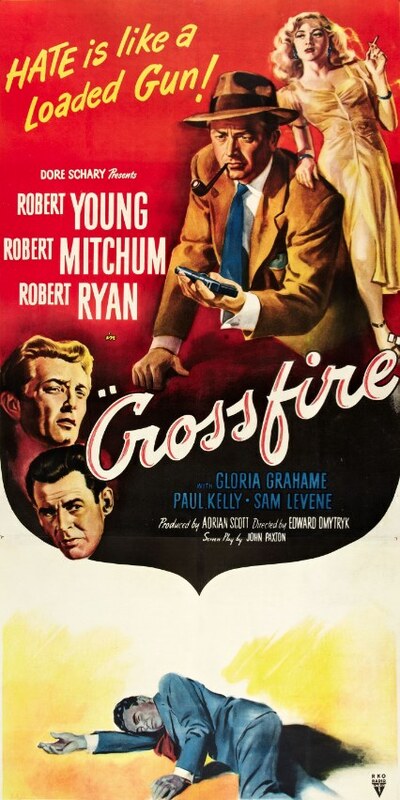 Dmytryk was an excellent director, and Crossfire is an exceedingly well-made film. 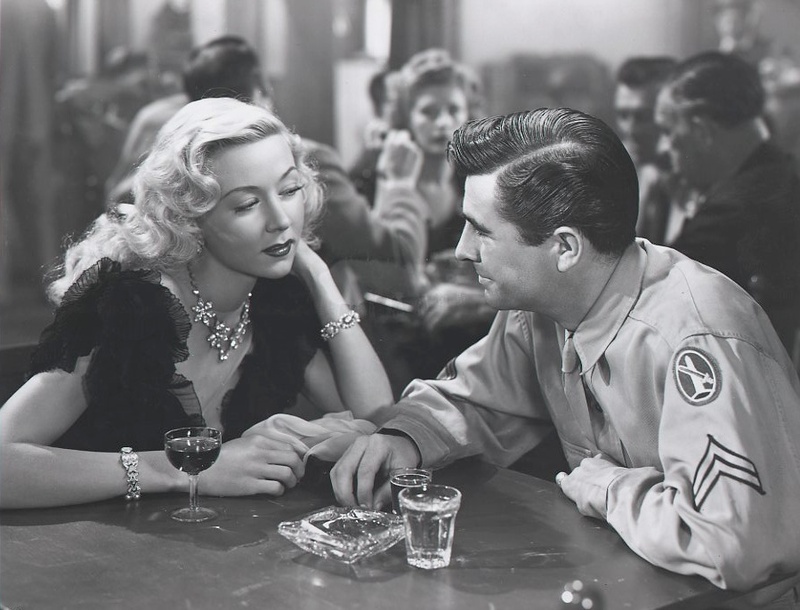 The darkness and shadows that creep into each shot disguise the simplicity of the sets, and the performances from all the actors are exceptional, especially Robert Ryan as the vicious, Jew-hating soldier named Montgomery, and Gloria Grahame as a lonely B-girl named Ginny. The beating death of the Jewish man, Samuels (Sam Levene), that opens the film takes place in darkness, so the culprit is not seen. But the mystery doesn’t really persist. Montgomery is the likely suspect right from the beginning. His sneering dismissal of the “kind of guy” Samuels was makes his guilt seem pretty obvious during the scene in which he’s interrogated by the police detective, Finlay (Robert Montgomery). The film quickly switches gears, however, and focuses on the search for a missing soldier named Mitchell (George Cooper), whom the police suspect of the murder. The jaded and world-weary Sgt. Keeley (Robert Mitchum) helps Detective Finlay, but ultimately shields Mitchell, helping him hide in a movie theater while Keeley and his buddies try to sort out what really happened. Mitchell was pretty drunk, and can barely remember what happened at the party that evening. But the last words we hear Montgomery say in Mitchell’s flashback to the party — “What’s the matter, Jew boy? You afraid we’ll drink up all your stinking wonderful liquor?” — cement Montgomery’s guilt. Mitchell’s sad and lonely journey through the night is classic noir stuff. His strange encounters — like the ones he has with B-girl Ginny and later with her “husband” (played by Paul Kelly), whose name we never learn — are haunting. While Crossfire is occasionally preachy, this can be forgiven, especially considering the time when the film was released. 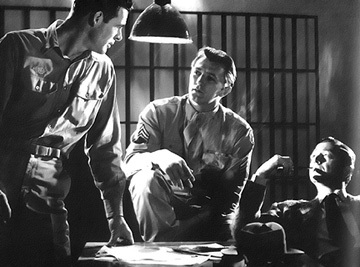 Unlike Brute Force (1947), which showed what American fascism could look like at the upper echelons of authority, Crossfire is a portrait of the rank and file of fascism — the dumb, mean, resentful men who “just carry out orders,” and do so happily. Ryan doesn’t overplay his role, and he’s all the more scary for it. Posted in 1947, July 1947 and tagged Edward Dmytryk, Film Noir, George Cooper, Gloria Grahame, J. Roy Hunt, RKO Radio Pictures, Robert Mitchum, Robert Ryan, Robert Young, Sam Levene. Bookmark the permalink.